Growing up in Singapore, I noticed that Halloween is an event more for teens/adults than kids. We don’t see kids trotting down the streets in adorable “horror” costumes, knocking door-to-door saying “trick-or-treat!”, like what we often see in American movies. Instead, during the month of October, theme parks in Singapore will organise Halloween Horror Nights and hire actors/actresses to dress up and go around scaring people in the theme park. I’m never a fan of horror stuff and since I’m a believer of “why pay money to scare myself?”, I’ve never been to such events, except for one when I was under peer pressure haha. So it was pure randomness when I had a sudden desire to bake a Halloween treat. 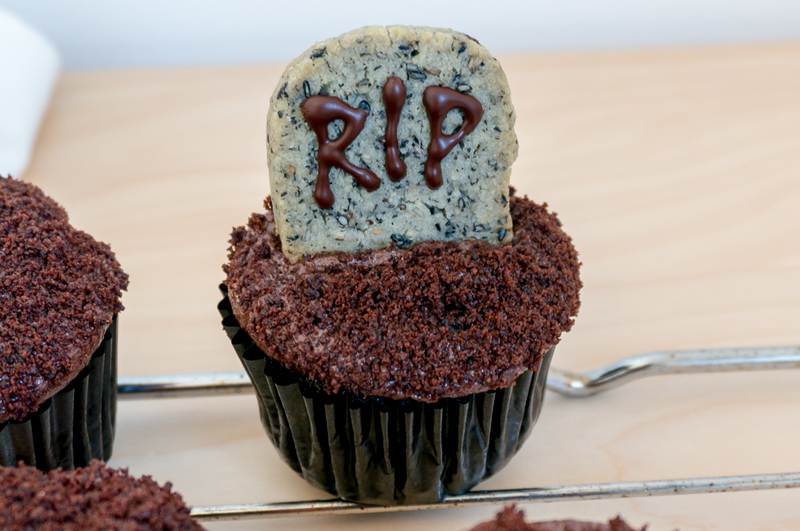 There are plenty of Halloween cupcake ideas out there, from spiders to owls to pumpkins to ghosts to Frankenstein… in the end I settled for a graveyard / tombstone cupcake as there are only 4 components (though originally there was 5) and it does not test my artistic skills as much. I originally wanted to use my all-time favourite Devil’s Chocolate Cupcakes recipe but I felt that I’ve used it too often, hence I changed it to a Baileys Chocolate Cake, which is an extremely simple, no-mixer-needed cake that is moist and packed full of Baileys flavour. I initially wanted to fill the cupcakes with a red sauce so that it resembles “blood” and will ooze out when one bites / cuts into the cupcake. However, it’s not the season for strawberries yet and raspberries are freaking expensive so I ended up using a white chocolate ganache that is dyed red with food colouring. But alas, the ganache seemed to be absorbed by the cupcake, leaving none to ooze out when I cut into it. So I simply left out this whole component in the end. I wanted a dark-coloured frosting so chocolate is the way to go. I used a Cooked Flour Frosting flavoured with cocoa powder as the frosting is not too sweet and I had milk on hand. You can use whatever chocolate frosting you like! I could have used store-bought crushed Oreos for the soil, but since I have homemade ones on hand, that’s what I used! Black Sesame Cookies are perfect for the job because of their greyish tint. The cookie dough was shaped into a tombstone log, chilled, sliced, baked, cooled then decorated with melted chocolate. The red colour in the centre was a failed white chocolate ganache dyed red… it’d probably be a lot nicer if a strawberry or raspberry sauce is used! Overall this is a pretty fun project, from baking to assembling to photographing them. I’ve spread out the work load by baking the Oreos and Tombstone cookies ahead of time, while baking the cupcakes, whipping the frosting, decorating and assembling them on the same day. It’s not as difficult as making those owl or spider cupcakes, which I believe requires more patience to stick the different owl / spider parts together (and patience is something that I don’t have!) It’s also my first time taking photos in a more moody atmosphere and though they are far from perfect, I’m still quite pleased at how they turned out. 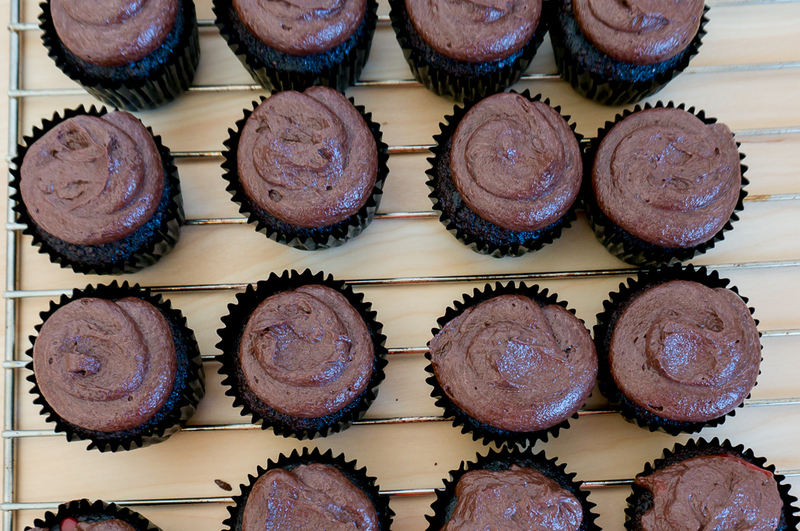 In terms of flavour, the cupcakes are chocolatey and boozy, one of my favourite flavour combinations in a cake! Below are photos of the 4 components – the individual component’s step-by-step photos can be found in previous posts when I first make them! 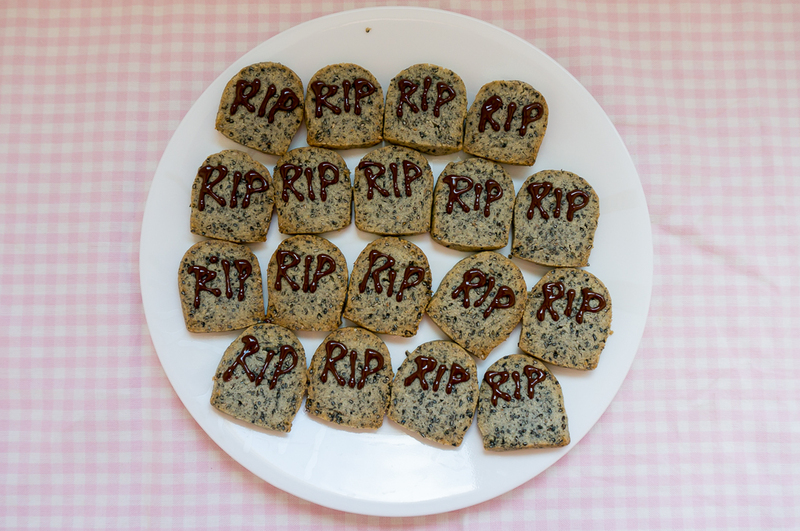 Bake some Black Sesame Cookies in a tombstone shape and decorate with melted chocolate. 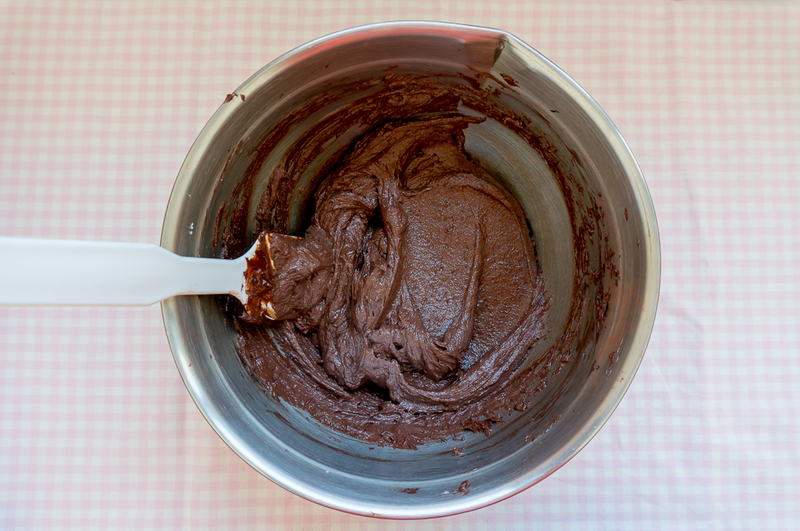 Whip up a delicious Cooked Flour Frosting – this time flavoured with cocoa powder! 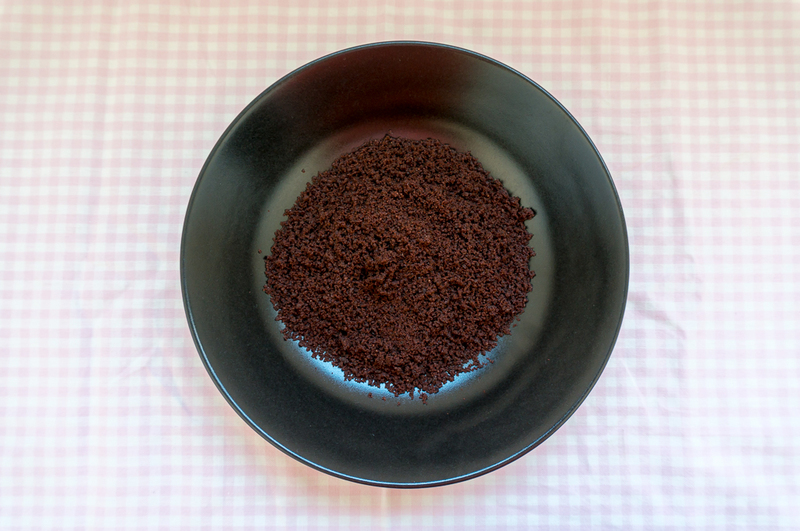 Prepare some biscuit crumbs for the “soil” – I’m using my homemade “Oreos”! Dip in biscuit crumbs then press a “tombstone” on top. 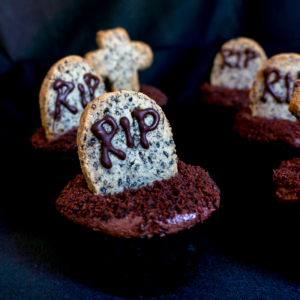 And voilà – Graveyard Cupcakes! Process the black sesame seeds in a food processor - you can grind it finely or chose to leave some whole for texture. Place the butter and sugar in a large mixing bowl. Cream with an electric mixer until light and fluffy, about 4 to 5 minutes. Add in the egg yolk and beat until it is fully incorporated. Add in the ground sesame seeds and almond meal. Sift in the flour and salt. Mix until a dough is formed. Divide the dough into two (so that it is easier to handle). Turn out each dough onto a large piece of plastic wrap. Shape the dough into a tombstone shape - dome on the top and flat on the other 3 sides. Refrigerate the dough for at least an hour (I left mine overnight). Pre-heat the oven to 175C / 350F. Line a baking sheet with baking parchment. Slice the cookie dough - about ¼ inch thick each - and place the slices on the baking sheet. Bake the cookies for about 13 to 15 minutes until the edges are lightly browned (mine was over-baked a little). Let the cookies cool completely on the baking sheet before storing them in an air-tight container. As the recipe makes 40 to 50 cookies, once you have sliced and baked about 30 cookies (make extra just in case), you can freeze the remaining dough and save them for another day when you crave for cookies. The cookie dough can be kept frozen for up to 3 months. The cookies can be made 3 to 5 days in advance. In a mixing bowl, combine the butter and caster sugar. Beat with an electric mixer until light and fluffy. Add in the vanilla extract and the cooled milk mixture. Beat with the electric mixer until thoroughly combined. Sift in cocoa powder and beat until fully incorporated. Frosting can be made 3 days in advance. Store in an air-tight container in the refrigerator. Let it soften at room temperature before using. Preheat the oven to 160C / 320F. Line 24-muffin tin with cupcake liners. Set aside. Sift in the flour mixture and whisk in gently until all the flour has been incorporated. The cake batter will be thin (very liquidy). Fill cupcake liners until ¾ full. You will end up with about 24 cupcakes. Lift up the tin and drop it on the table counter-top gently 3 to 5 times to remove excess air bubbles. Bake the cupcakes for 20 to 25 minutes until a skewer inserted into the centre of the cake comes out clean. 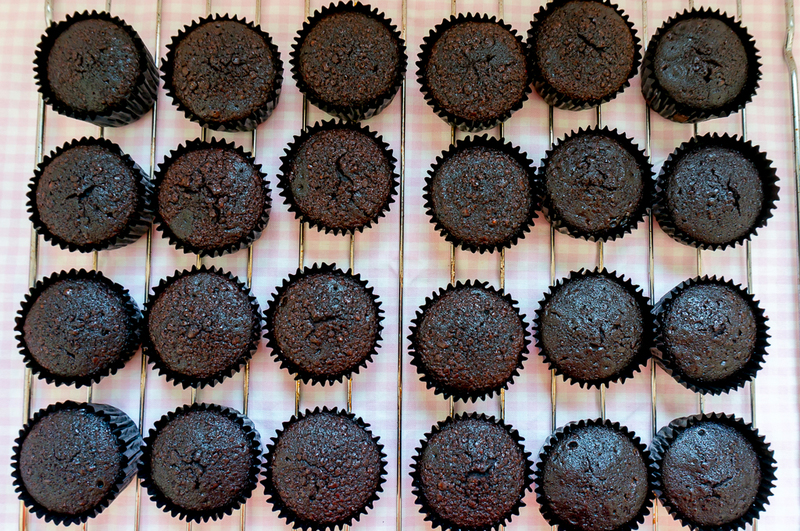 Place the muffin tin on a wire rack and let the cupcakes cool completely in the muffin tin before frosting. Cupcakes can be made 2 to 3 days in advance. Place the cooled chocolate into a piping bag and snip off just a tiny bit at the end. If the chocolate is not thick enough to pipe, refrigerate the chocolate (in the piping bag) for 3 minutes and check the consistency. Chill until you have a thick consistency to pipe. 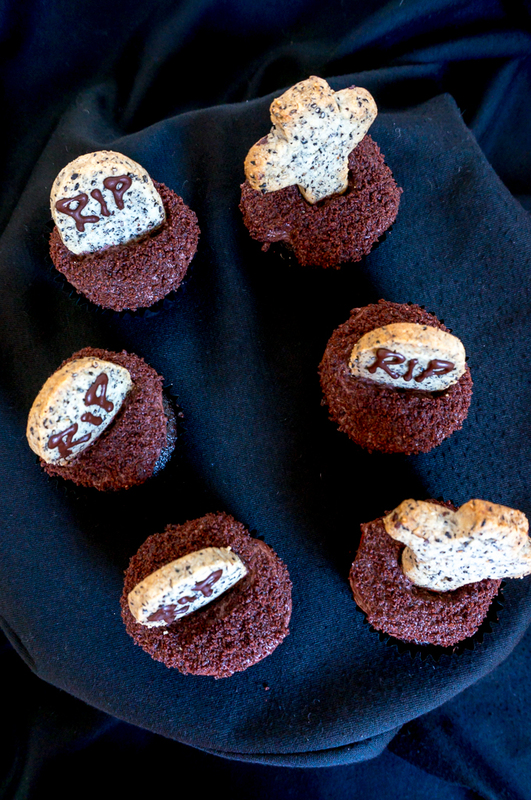 Place the Tombstone Cookies on a baking sheet or a plate. Pipe "RIP" or desired wordings with the chocolate. Refrigerate the cookies until the chocolate has hardened completely. Fill the Chocolate Flour Frosting into a piping bag fitted with a plain tip. Pipe the frosting onto the completely cooled Baileys Cupcakes. Place the crushed chocolate biscuits in a small bowl. Dip the frosting very gently (if you press the frosting too hard, it will flatten the frosting, making it hard for the cookie to stand upright) into the crushed chocolate biscuits to coat. Alternatively, use a spoon and sprinkle the crushed biscuits on top of the frosting. 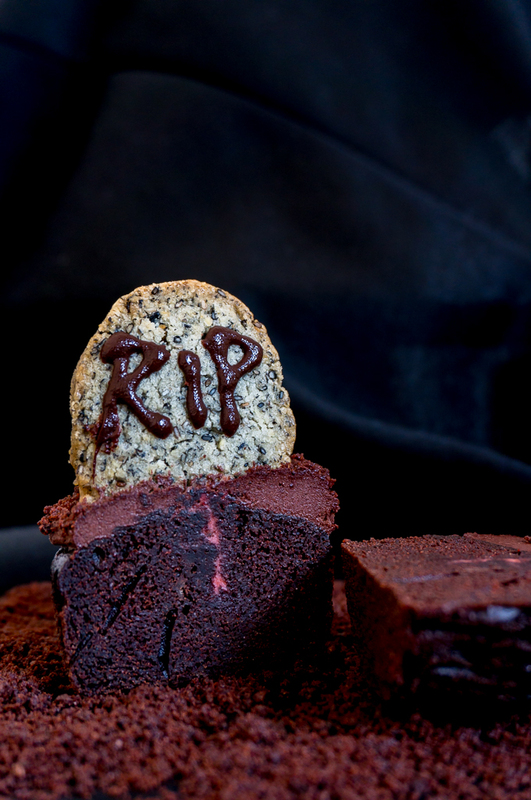 Press a Tombstone Cookie in the middle of the frosting. Refrigerate the cupcakes for 15 minutes so that the frosting can hold the cookie in place before serving. Place the cupcakes on a black/dark serving tray and sprinkle the remaining cookie crumbs all over the tray. - As there are several components to the cupcake, it's best to plan and make some of the components ahead of time so that it makes life easier. - It's best to decorate the cupcakes on the day or the night before serving. Store the cupcakes in a container in the refrigerator to harden the frosting and to prevent the cookie from absorbing the moisture from the frosting and turn soft. If the cupcakes has been chilled for several hours or overnight, let the cupcakes rest at room temperature for 10 to 15 minutes before serving. Do not let it sit out for too long as the cookies will lose their crispness and turn soft. - You can also fill the cupcakes with a strawberry or raspberry sauce to create a flowing "blood". Omg!! This is so cool!! I love how this looks and these are perfect for a halloween potluck, this is definitely what I would make if I were attending one haha! Spooky! I would love one of those Baileys cupcakes right now 🙂 So creative, Jasline! This looks so cool, pinterest worthy! These are beautiful, Jasline! Makes me wish I was your neighbour ..I will definitely pop in for a bite! They are such a perfect treat for Halloween! They are indeed! Have a spook-tacular Halloween! Anything with chocolates…they looked oh so delicious!!! Haha I guess no one can resist chocolatey bakes! Thanks Charmaine! Thank you Zoe! Is Melbourne very hype over Halloween? Are your kids going to be doing trick or treat? Oh “I’m so scared!” … hee hee ! Kids in most kindergartens do celebrate Halloween with some fun activities and they got to dress to the theme instead of the uniform. 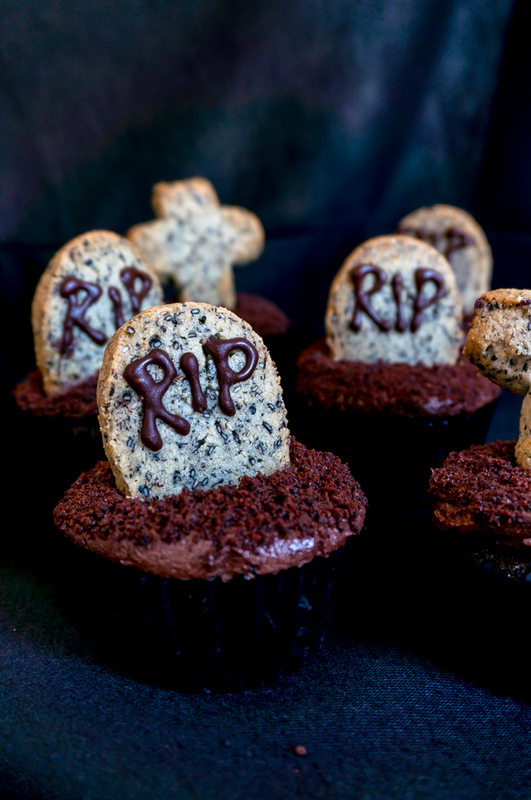 I like theTombstone Cookies though … thanks for sharing these graveyard cupcakes! 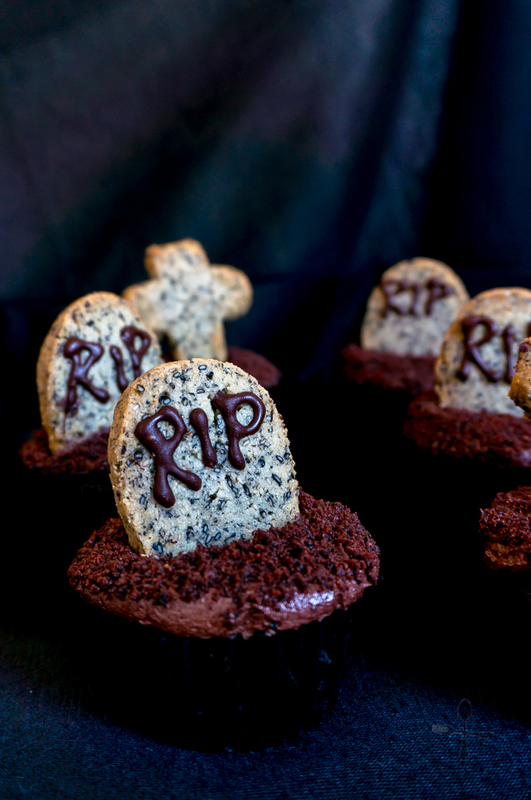 Oh I love those cupcakes Jasline, perfect for Halloween with that spooky gravestone They look amazing! !